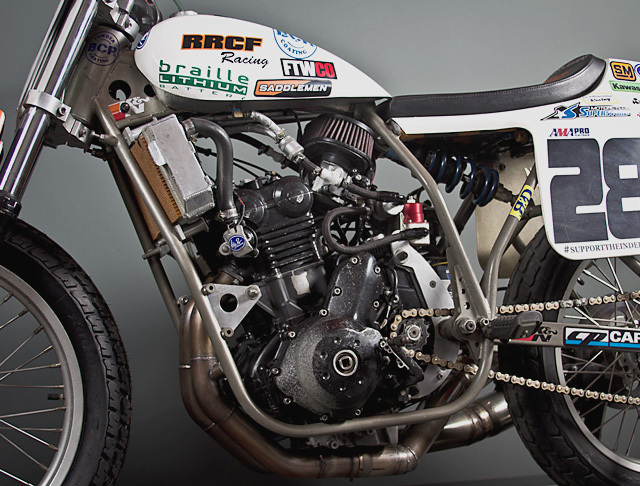 In the modern renaissance of the custom motorcycle scene the Tracker inspired builds have become a favourite the world over, with the best builders and workshops in the game having produced multiple examples. One of the best built is River Rat Cycle Fab’s Yamaha XS650 screwed together by Heath Reed featured here on Pipeburn last year. 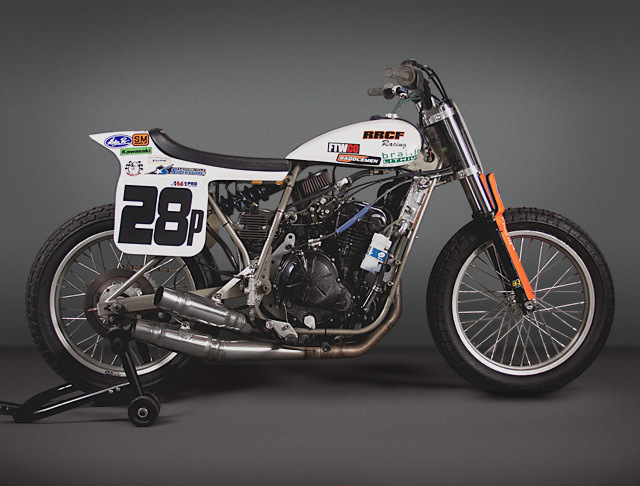 Now with this fully fledged AMA Pro Flat Track Racer we can finally appreciate where Heath and his RRCF team get their inspiration for such amazing road based Trackers; They build the real thing, capable of 130mph and some serious sideways action! It’s the sport that Valentino Rossi, Marc Marquez, Troy Bayliss and many of the best riders have taken as their new passion, it’s where King Kenny Roberts first made his name and it’s where Heath and the RRCF Racing team are hoping to do big things with this Ninja 650 powered machine. A search of eBay had a Kawasaki 650 on the way to the shop and with the engine picked out it was time to order a frame. 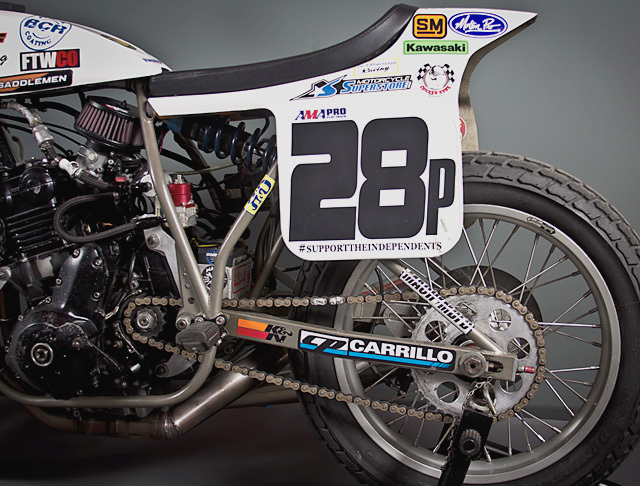 A stock Ninja unit is never going to be up to the task so Heath had the guys at Baer Racing Products make a custom chassis from the very best chromoly to fit the Ninja 650 motor. You don’t have to spend long looking at the fabrication work to realise Heath had made a great decision, beautiful welds, flawless construction and in a mono-shock configuration this is race engineering at its finest. The mono-shock chassis is set up to take a Penske unit on the rear so you know the suspension is going to be serious and given that Baer race AMA as well there is a great deal of R&D that goes into their work. With the chassis on the bench Heath knew it was time to get serious with the engine, stock doesn’t get you anywhere but the back of the field. The 649cc unit is more than capable as a race engine even if it comes from a budget minded road bike. It’s also the dominant engine in the Super Twin category at the Isle Of Man but just as with road racing there are but a few tuners truly capable at this stage of making a great race motor out of one. 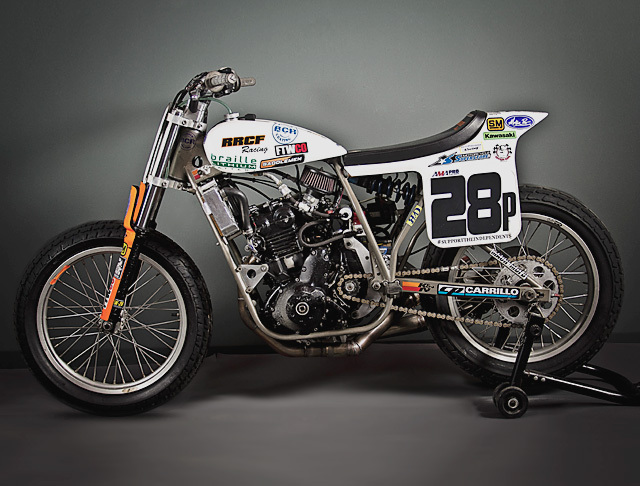 So Heath sent the engine out to New York to the lads at Mach Modified so they could wave their wand over the liquid cooled, DOHC, 4 valve motor. 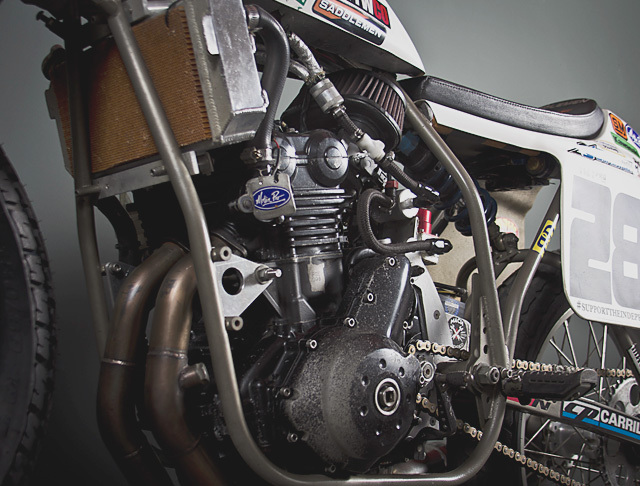 From AMA Dirt Track and Superbikes to NHRA Drag Racing and land speed records Mach has built race engines for many teams and the majority of the internals in the Kawasaki engine are their own blend of custom secret ingredients! Heath estimates the power increase is about 40% over stock but just as importantly is the engines ability to live lap after lap at high RPM as Itchy keeps the throttle pinned! 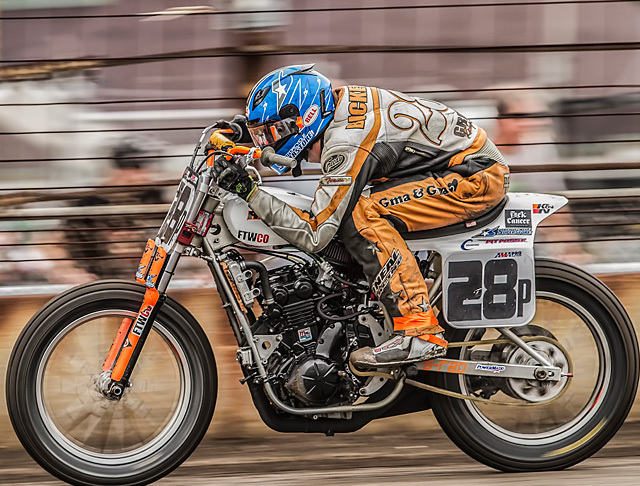 Suspension is obviously a vital component of a Flat Track racer, and tuneability is imperative to be able to set the bike up for each different track and the conditions that change throughout a race meeting. At the front end, custom triple trees hold telescopic forks from a Honda 600 F4I, while the rear swings a fully-adjustable Penske shock. This would cut the mustard at the lower levels, but in GNC1 when playing with the big boys, things have to be perfect so Traxxion Dynamics fitted one of their custom fork cartridges to the front end and revalved the Penske. Obviously there is no front brake, but the rear is a foot-operated disc with a master cylinder from Nissin. Just ponder that for a moment – 130mph, approaching a turn and no front brake. 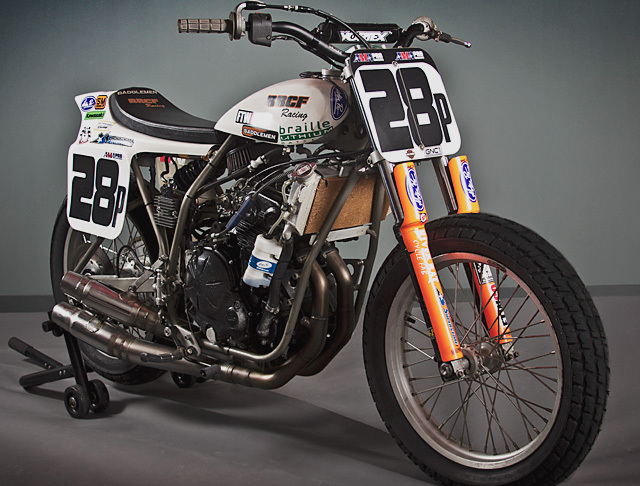 Flat Track racers have serious cojones! 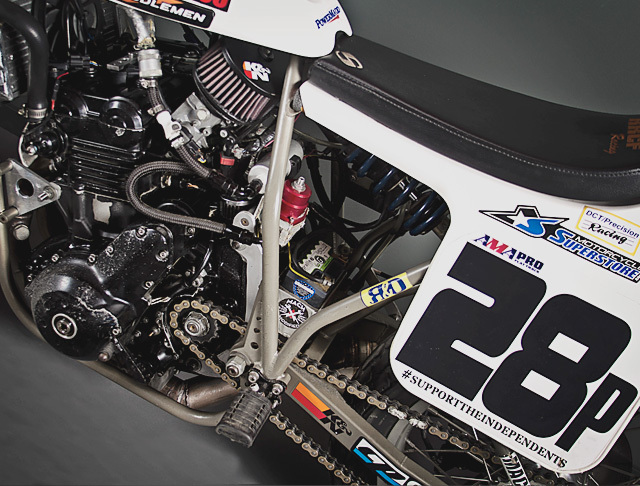 With a rolling chassis sporting some serious hardware, the team got to work on building and fitting all the bits and pieces that makes a race bike go together, and just plain GO. The wiring harness had a good deal of its bits and pieces removed, and was designed to fit the new chassis with all the modern “safety” elements removed. The fuel system has been upgraded to meet the demands of a race bike and you can see signs of that with the red anodized aftermarket regulator clearly on display. 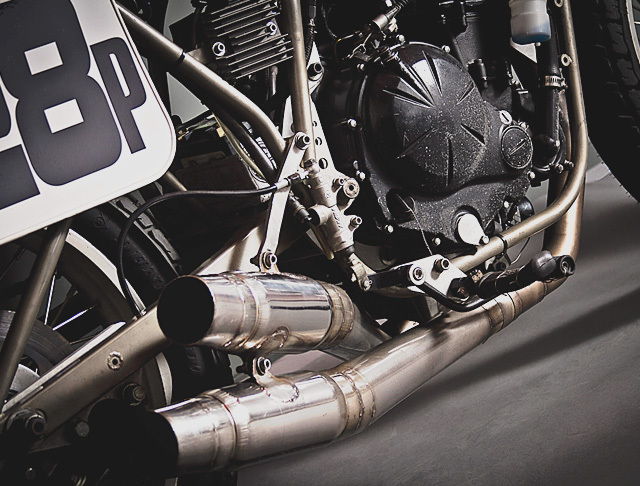 The race motor now breathes through filtering by K&N, and you can only imagine the bark of the twin pipe exhaust system that looks as angry as it must sound. The regulator rectifier and the aluminum radiator are stuck out in the fresh air for all to see, with cooling the only concern. Like the rest of the build, the body work is all business. 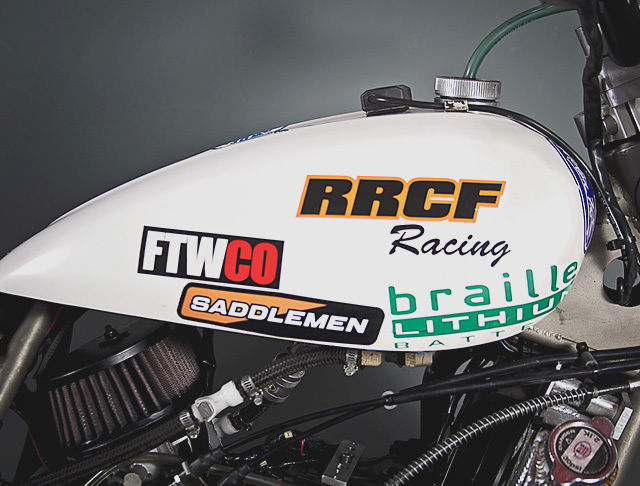 The tank and tail-piece are quintessential ‘tracker’ and are adorned with a host of sponsor and supplier decals as well as the all important race number that also is laid down on the front number plate. 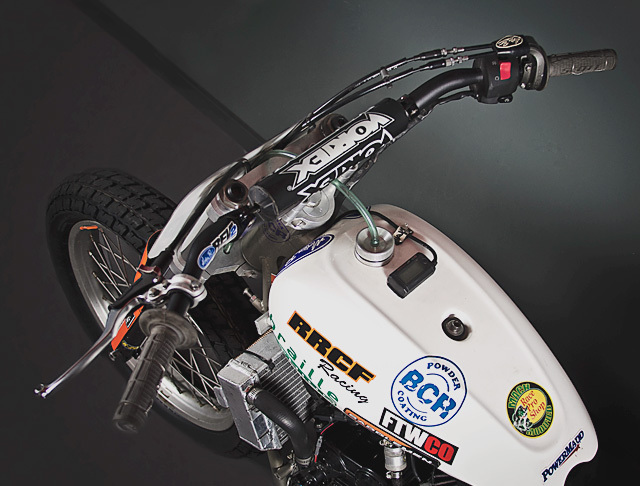 The bars feature Scott grips that are raced wired into place (like many of the other components on the bike) and aside from the throttle, there’s nothing but the switchblock to fire the engine and a clutch lever. The all important rubber is courtesy of Dunlop, with lightweight Sun Rims wheels to keep the unsprung weight as low as possible.